I missed out on doing challenge no. 2 which was using the technique from Tim Holtz's book on page 62 'Fragments Basics' - mainly because I don't have any of the fragments. No doubt I will buy some soon though so I can come back to it then. Challenge No. 3 is 'Alcohol Ink Monoprint' using the technique from Tim Holtz's book on page 51. If you want to know more about these challenges visit Linda's blog at Studio L3 where each week she will be setting a challenge from the book 'Compendium of Curiosities' - and there are prizes too!!! Here's my entry using this technique which I've made into a greetings card (even though there isn't any greeting on the front of it - LOL). I had several attempts at this before settling on this one. The problem was I think using cheap photo paper which gave a rather sludgy result. I found some glossy paper in my stash which worked much better with the alcohol inks. Even so, I cheated a little bit a dropped a few drops of the ink on the top and around the edge. The stamps I used were Tim Holtz's Stampers Anonymous (Artful Flight) for the large bird and Stampendous (Cling Bird Cage Trio) for the two bird cages, which you may just be able to see in the background, stamped in gold. I mounted the glossy piece onto two pieces of black handmade paper which I die cut with Tim Holtz Alterations Sizzix die (Scallops). I haven't been doing much blogging - or crafting lately, too many distractions what with the World Cup (less said about that the better! ), Wimbledon, catching up on some gardening and enjoying all the lovely hot weather we're having at the moment. However, I had to mention two blogs awards I've received recently. The first is from Jan who has a beautiful blog at Jan's Artyc ATC Journey. Many thanks Jan for this award and I am now supposed to tell you all ten interesting things about myself and then nominate ten other bloggers for the award. Well, the nominating bit would be easy as there's many many beautiful blogs out there, but the interesting things about moi - hmmmm, yes, I think I'll have to get back to you on that one - LOL. Go and have a look at Jan's 10 things though, they do make an interesting read. 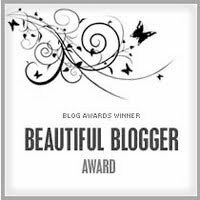 The second award is from Debbie, another beautiful blogger at Chameliarts. This is what I am supposed to do "Tell 6 outrageous lies and 1 outrageous truth about yourself , or switch it around and tell 6 outrageous truths and 1 outrageous lie about yourself. Then, nominate 7 others and leave them a message to let them know" I'm going to have to take a rain check on that one too! Outrageous, moi? In my dreams - LOL. If you'd like a good laugh though go and have a look at Debbie's 7 outrageous things about herself. Or maybe I shouldn't say laugh as they may all be true - sorry Debbie if they are, but what an interesting person you are. If like me you bought Tim Holtz latest book 'A Compendium of Curiosities' as soon as it became available, but haven't yet explored it thoroughly, this new challenge is ideal! You can find it on Linda Ledbetter's blog Studio L3. The first challenge is Water Stamping. Following Tim's tutorial on page 35 of the book I created some toppers for a greeting card as shown above. I haven't got any Distress Embossing ink, so used some ordinary Versamark embossing ink instead. I also stamped the image onto some water colour paper. The technique is applied to the background of my card, and I overstamped another image with black ink. I wanted to do more to the card, but forced myself to keep to the one technique. I made another background using the same technique, but haven't decided what to do with it yet! I wonder what the next challenge will be! This month over on the Art 'n' Soul Flickr group the challenge is to create a ribbon hanger for your swap partner who will be randomly allocated. The challenge has been set by Petra who has made some beautiful hangers which you can see over on her blog Kunterbunt Cottage. My hanger is made from thick card (measuring approx 5 inches square) covered with scrapbook paper. I punched two one inch holes at the bottom for the ribbons to hang from. I then pencilled in the girl's face and coloured it with acrylic paint and distress ink. The hair is part of a wool scarf which has the look of curly hair - and of course, she has two little blue ribbons in her hair. As my hanger only has two holes, there isn't much scope for hanging too many ribbons - especially if my swap partner has as many as I have - still, you can't have too many ribbons can you! On the subject of ribbons, there is a lovely blog which I have mentioned before, called Crafty Ribbons and every Friday there is a 'Friday Freebie' - a ribbon giveaway! All you have to do is go visit and leave a comment. There are also some great ideas and tutorials over there too. The Artist Trading Club ... 'Swap Til You Drop' challenge for this month is 'Mini Dress It Up' guested by Margaret who hosts the monthly Dress It Up challenge on her blog Alice and Camilla. 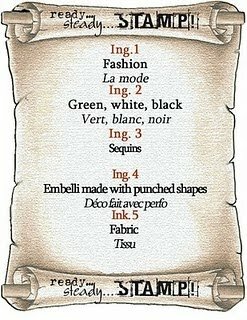 Margaret has a tutorial on her blog where she shows in very easy steps how to make a paper pocket. To make a pocket ATC you need to start off with a rectangle of paper measuring 13cm x 19.5m, then follow Margaret's paper pocket tutorial above - easy peasy! The amber and pink dresses, I rubber stamped onto and for the rest, I covered the card base of the dress with fabric. I rubber stamped some mini mannequins onto tissue paper then applied them to the corner of the pockets with Liquitex gel medium (except the green one which I just rubber stamped directly onto). To finish them off, I machine stitched (roughly!) around the four sides of the ATC. What a lovely challenge - and a great pocket tutorial from Margaret too! The current challenge on the Ready Steady Stamp blog is to create something using at least three of the five required ingredients as shown in their banner below. I had been making some of these pocket ATCs for another challenge (more about that in my next post) and decided to make one for this challenge also. I didn't use ingredient 4 - the punched embellishments, but think I've covered everything else! If you're wondering what the diamond pin prick marks are down the centre of the dress, it's where I tried to use a fancy machine stitch but hadn't threaded the machine up properly - so now it's an unique design feature! I made this apron for the 'Hymnal Title Challenge' currently running by Thespa on her beautiful blog called Vintiquities Workshop. "Below I have offered scans of song titles from an old hymnal. I love the font that was used for these titles and I enjoy using them, now I want to see what you can do with them. Simply print and use any of the song titles I have provided in any type of artwork. They can be used in Jewelry, tags, cards, altered art, mixed media, gifts, home decor, painted works, cut and paste, or stitched items. Use your imagination and get creative. You may use any portion of the titles shown, one word or the whole line." She is even offering prizes too, although I'm not sure if they extend to overseas bloggers. Nevertheless, I still couldn't resist this challenge and made this little apron following the chapter 'Art Girl Doll and Apron' of my latest book 'Layered, Tattered & Stitched' by Ruth Rae. The apron is basically a sandwich of sheet music between two layers of organza fabric, then all machine stitched together. The hymn title I chose was 'A Friend of Mine' and I must agree with Thespa, the font is beautiful. I sandwiched the title between more organza and stitched it to the apron as a belt, under which is a little hand made lace. The pocket shows the number 391 which was part of the title (the number of the hymn?) and made in the same way as the belt. I finished the apron off with some thin black ribbon for the ties at the waist and the neck, made a little wire hanger and rubber stamped the two tiny pegs. What a fun project, and the apron will be for a friend too, so how approriate. I'm ahead of the game this month, having made by dress for June already! This is for the challenge set by Margaret on her blog Alice and Camilla whereby all participants create a little dress every month. If you hadn't already noticed, my dress is orange! One of my favourite colours and it seems appropriate for this month as we have already had some very hot weather here in the UK. I didn't really have a plan for this dress and pretty much made it up as I went along (as is evidently obvious from looking at the photo!). Here it is with some of the other dresses in the wardrobe I made, further details about which are here. If you'd like to see other participants' dresses for June here's the link. This month Margaret is also offering her own June dress as a giveaway. To be in with a chance to win it, you just need to make your own dress for June and put a link on Margaret's blog. Good eh! "The idea of the swap is to make a pretty pocket organizer and fill it with things your partner will love..." .... said Jessica on her fantastically named blog Kids Napping? I'm Scrapping! I loved the sound of this swap especially after having seen some beautiful ones on Jessica's blog so signed up and was lucky enough to be partnered with the very talented Mrs A who also has an interesting titled blog called It's An Alien Life! The brief was to make a pocket organizer with 3 pockets or more and fill it with things our partners would love. We exchanged lists of our likes and dislikes to help us along. Among Mrs A's likes were lace and frills, flowers, buttons, shabby chic style and the colour pink so these pretty much dominated my pockets. little book also in a vintage style with Mrs A's initial on. The art doll was made with a shabby chic Gingers Rogers style in mind - I couldn't quite get the hair right and of course it the wrong colour, maybe she's Blondie Rogers! I was quite pleased with my pockets .... then I received my swap from Mrs A and was blown away by what she'd made for me! A little padded box in the same fabric which contained a vintage button hook. A heart shaped pomander has a glorious floral perfume which was the first thing I noticed when I opened the parcel. A tiny pin cushion which looks like a minature cup cake with beautiful intricate stitches - it's adorable! I did say I was lucky being partnered with Mrs A and you can see why. There are more photos of the contents on the Pretty Pockets Flickr group along with photos of other participants' pockets. Mrs A is now in receipt of my pockets and I'm so pleased she likes them - big sighs of relief all around!